8 Keys to Mental Health Through Exercise - Description | W. W. Norton & Company Ltd.
We all know that exercise is good for physical health. Improved fitness has been proven to increase longevity and stave off illness. Recently, there has been a wealth of data proving that exercise also contributes to overall mental well-being. Routine exercise alleviates stress and anxiety, moderates depression, relieves chronic pain, and improves self-esteem. Christina G. Hibbert, an expert on women’s mental health, grief and self-esteem issues, here offers readers step-by-step strategies for sticking to fitness goals, overcoming motivation challenges and roadblocks to working out, and maintaining a physically and emotionally healthy exercise regimen. The techniques she offers will benefit readers at any stage of life or fitness level. 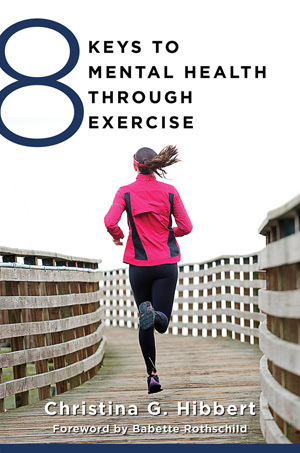 Whether you have worked out periodically in the past or have never hit the gym, this book will help you get moving, stay moving, and maintain the inspiration you need to reap the mental health benefits of regular exercise.